Nicolas Duchamp is one of those rare teachers who inspires his students by his energetic, engaging personality and exquisite flute playing. He is supportive, and sensitively respectful of the unique temperament of each student, thus providing encouragement to be " "themselves " in their playing. Nicolas Duchamp has a special gift of boosting self-confidence in his students and helping them to "Trust their innate musical instinct". His teaching philosophy is to encourage a natural style of flute playing. He is teaching and plays music, and not only the flute. He teaches "style" by telling stories to communicate musical concepts. The French School of flute playing demands flexibility with the ﻿instrument. 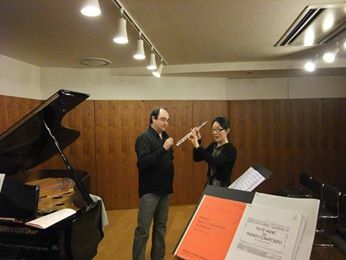 It requires using a wide range of subtle dynamics, and Nicolas Duchamp's teaching emphasizes that technical aspect of flute playing to help students achieve the most satisfying freedom ﻿of musical expression. An opportunity to learn more about the colorful, expressive art of French flute playing as taught by PHILIPPE GAUBERT. Nicolas Duchamp, through his mentors, is a direct descendant of Gaubert’s School. Emphasis will be on French articulation, sound production, tone quality. In 2009, The family of Philippe Gaubert (1874-1941) formally commissioned Mr. Duchamp to celebrate Gaubert’s contribution to the French art of flute playing in a worldwid tour. Duchamp created the concert and film homage, "GAUBERT VIVANT !" http://gaubertvivantproject.weebly.com/​ which he presented in a US tour including Carnegie Hall in New York, and Spivey Hall in Atlanta where he recorded an historic performance on the famous Gaubert flute Louis Lot N° 1986 for American public Radio's “Performance Today" for over 5 million listeners. This personal connection makes Duchamp a unique representative of the French flute school in the flute word. Several international flute magazines favorably reviewed Mr. Duchamp and his performances: Flute talk (USA), Traversiere Magazine (France), Flute (UK), NY Flute Club News Letter (USA), France- Amerique (USA).